Jake and I finally decided we were ready to upgrade to a King mattress... I happen to be a bit of a night terror. Poor Jake. We just paid off our living room couch with no interest paid thank you very much. Yay! We went big and got a SleepNumber bed. We figured that if we were going to get a bed it better be a good one. 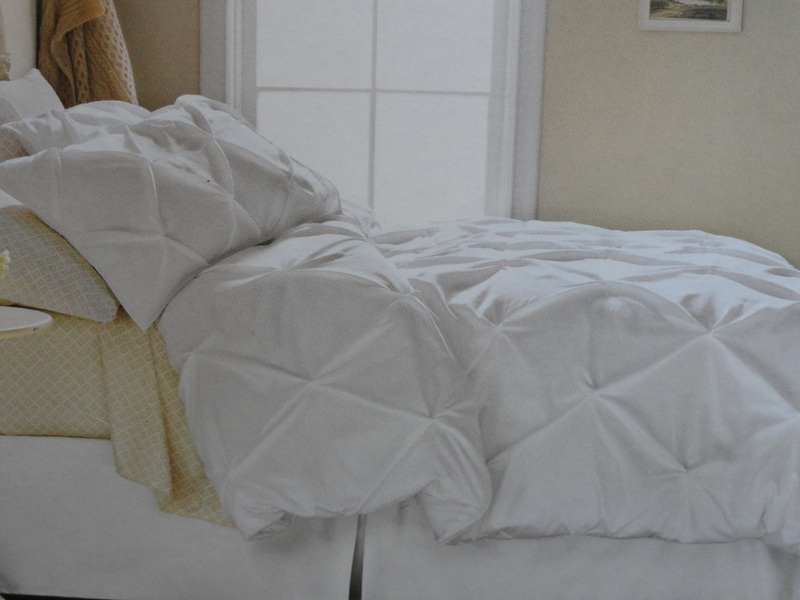 We picked the C4, the base and mattress cover which came out to $3,000.0o and some change. The plan to do the same thing and have it paid off in a year/year in a half with no interest. 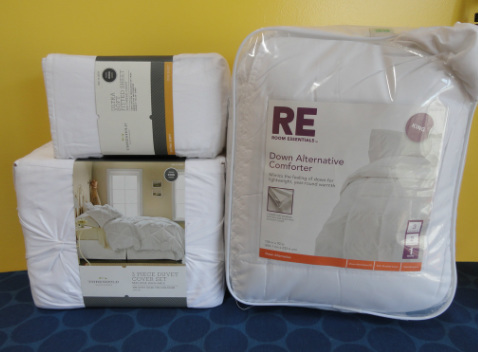 I found the above bedding set at Bed Bath & Beyond but the trouble is that for all the pillows etc that I wanted it was going to cost around $300. Yes, I know it sounds a little silly to be frugal after buying a really expensive bed. Sue me. So I went on the hunt! I checked Walmart, Amazon, etc etc etc online but sometimes you just need to go out and look yourself. My Target bedding above and to the top right...so much cuter than the Bed Bath & Beyond one. 5. Frames; some from DI, one was a gift from my mom and Hobby Lobby. So excited for my final frame. I am going to back it with chicken wire and hang my wedding bouquet from it or photos etc. Corina, my mother-in-law, took me shopping and to lunch as a late Birthday celebration. So fun. 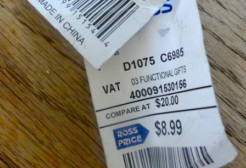 I found the best deal at Ross! 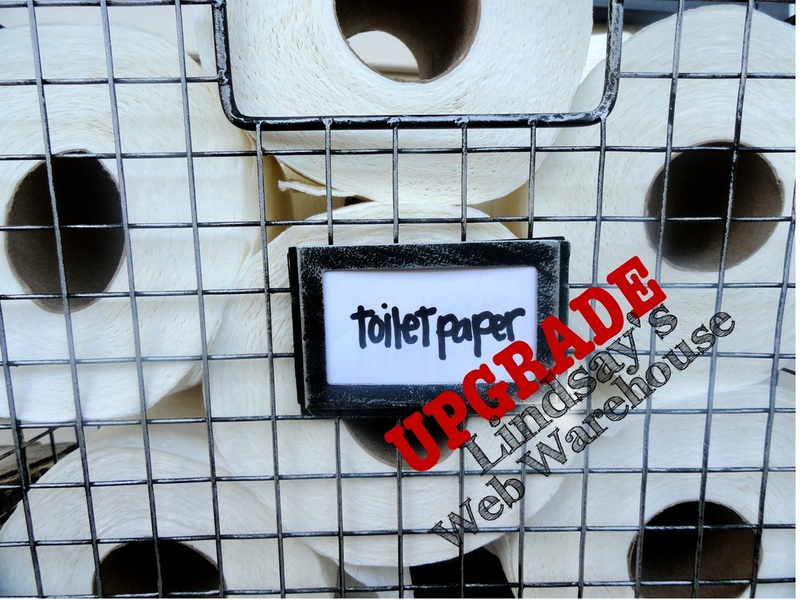 I have been looking for an industrial container for my toilet paper for my bathroom upstairs. 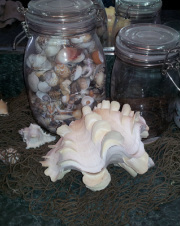 And Corina's sharp eye catches this beauty for $9.00! 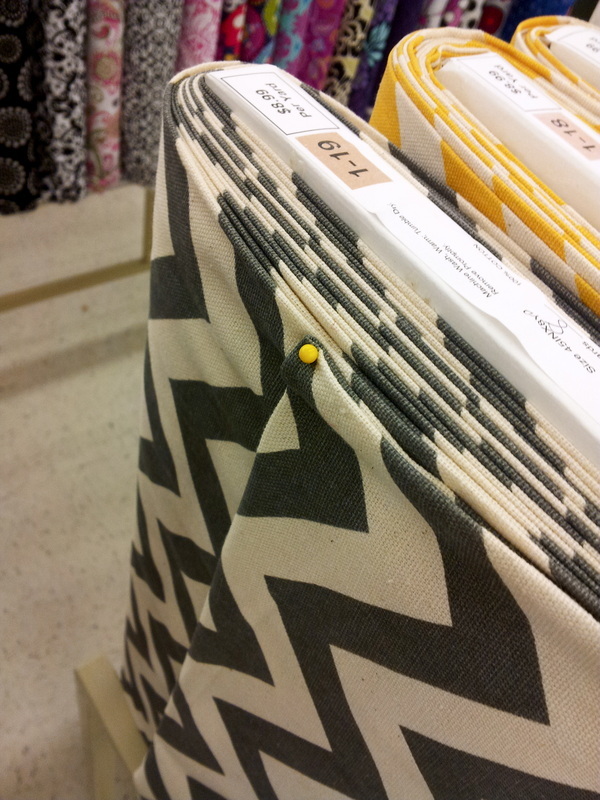 I had to include a picture of the tag [above] because I was so excited! The plan is to arrange as such [left], stumps and all. 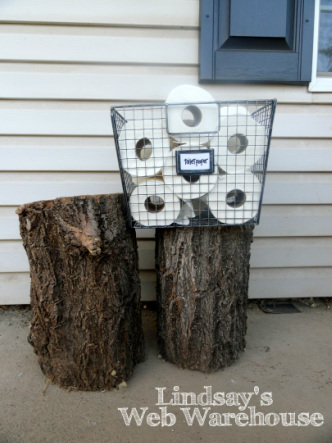 Now all I need to do is sneak my stumps past the hubby upstairs! I decided I wanted a kitchen upgrade. 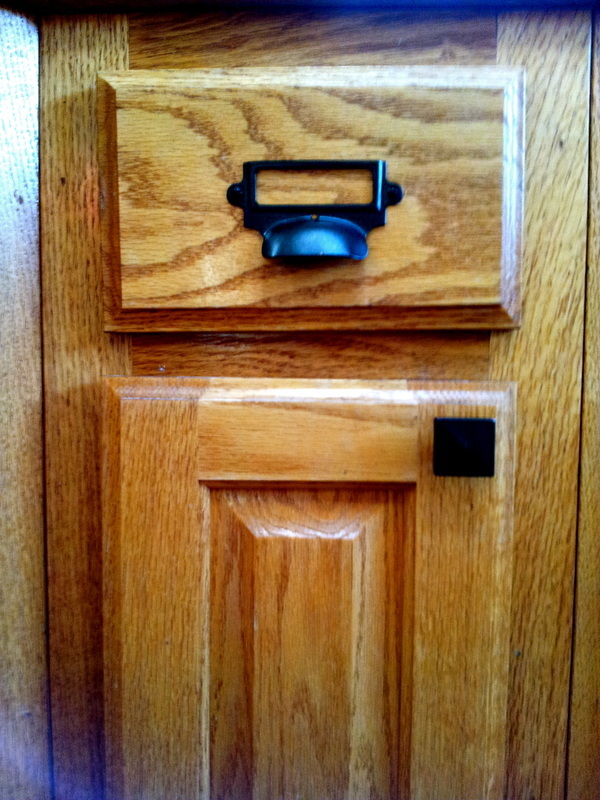 Obviously, new cabinets are really expensive so I decided to start small by adding hardware! 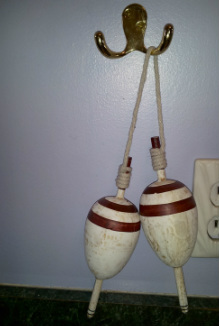 The pyramid knobs I got from Overstock. The label pulls I got from Van Dyke's Restorers. 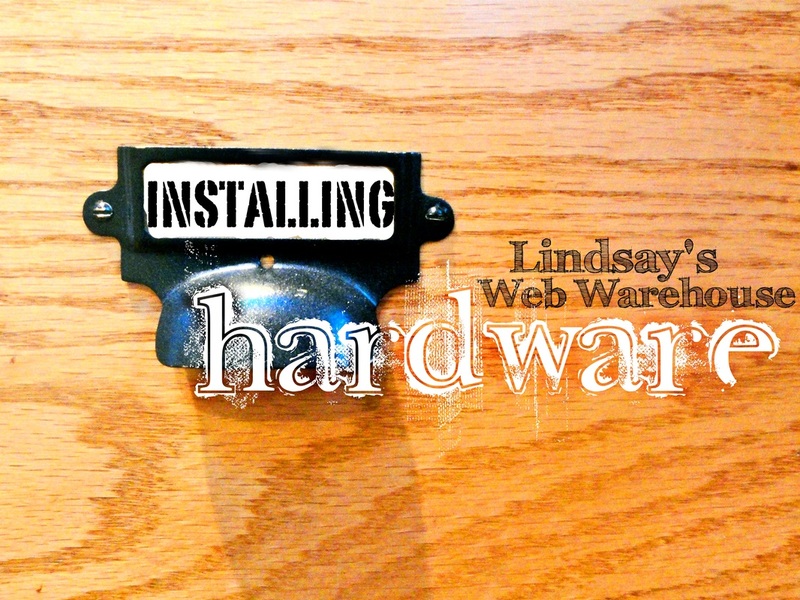 Start by marking where your hardware will go. I used a level for my label pull hardware to make sure it was straight and a ruler to make sure it was centered. 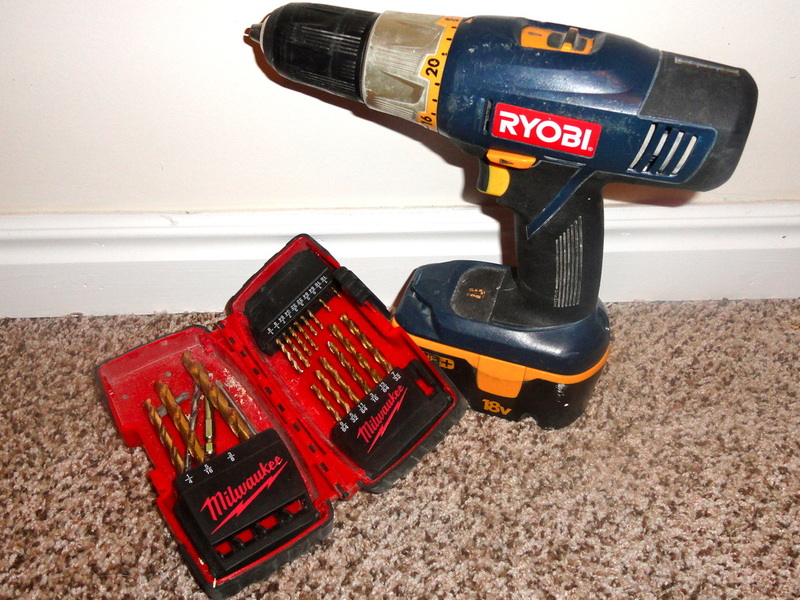 Find a drill bit that is the same, or close, to the thickness of your hardware screws. Put your drill bit tightly in your drill. 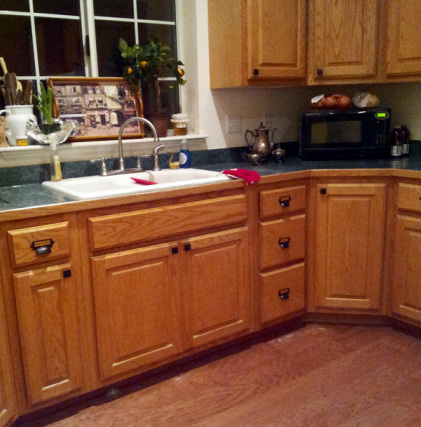 The pyramid knobs needed a hole that went all the way through the cabinet doors. Jake's drill has a level on it so I was able to easily drill a level hole. Very important. You don't want your hardware going in on an angle. I got a little tired and I have two interesting looking knobs. Put the drill bit in and out of the hole a couple of times after you make it through so that the screw is able to go through relatively easy. 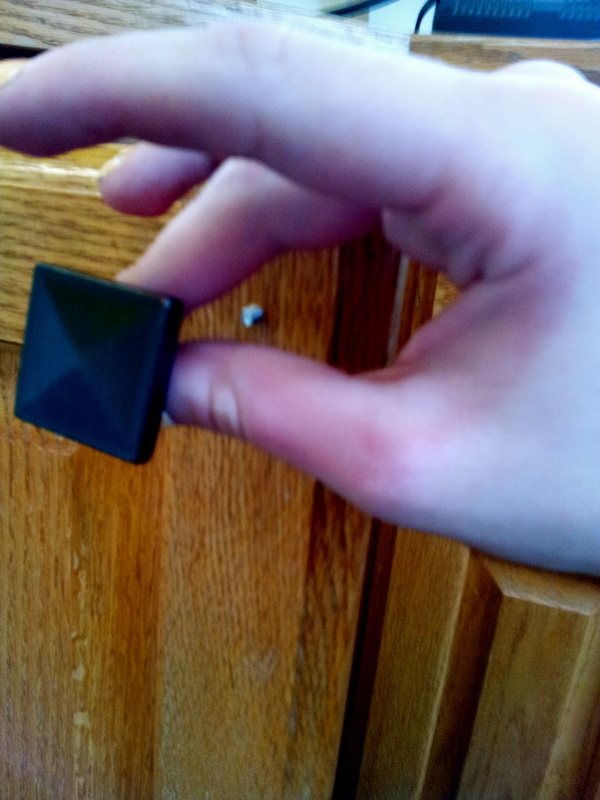 I tried putting my screw through after just drilling through once and pulling it out and it was a PAIN! You still want some resistance but you should be able to screw it in without working up a sweat and stripping your screws. You don't want to strip your screws! For my knobs I drilled the screw in from the back of the cabinet, with my philips head driver bit [top left image]. I screwed my knob right onto the exposed screw on the front [top middle image]. Easy. My label pull hardware did not need the hole to go all the way through drawer. I used a smaller drill bit since I had much smaller screws. 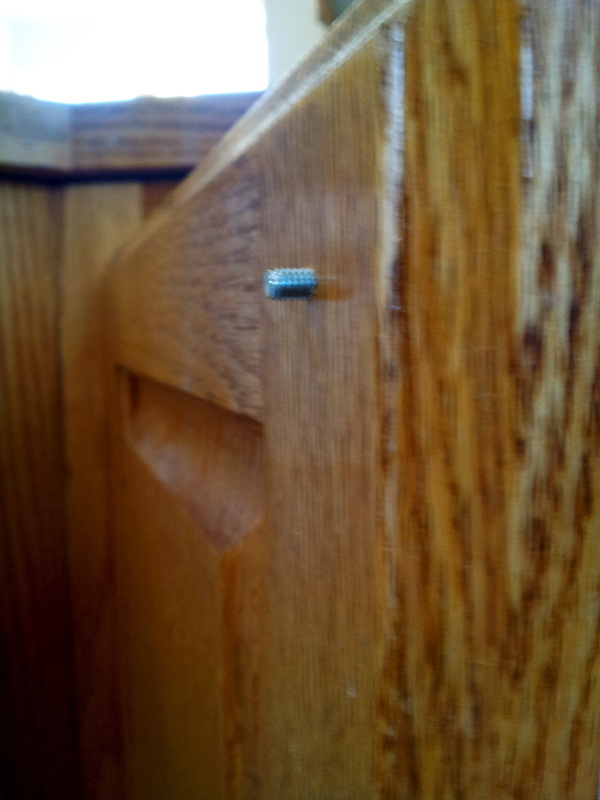 I only drilled far enough into the drawer to the screw to be completely in the drawer. I put my screws in by hand because the screws were too small for my driver bit and they called for a flat head. 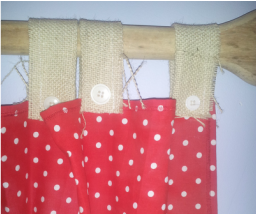 Now I just need to get some cute labels in those pulls! 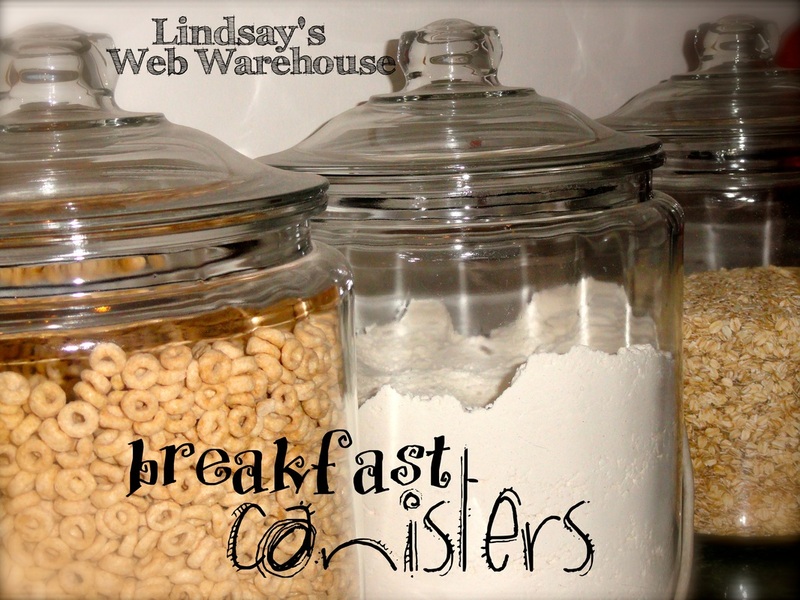 I love these large gallon canisters that I found at Walmart. They were around $10 each. They dress everything up so much! I really want to get metal scoops for each as well. This was one of my cheapest decorations ever! I was offered these beautiful antique window panels for free. Free! Anyways my mother-in-law, Corina had a friend that was re-doing a house and had the old windows. She let me snag 2 panels. Then Corina and I hoped on down to Tai Pan Trading, in the Provo mall, and I picked out this wreath. It was $4o but with my coupon I got out of there spending $22. Next ,I went to Walmart and got this burlap. 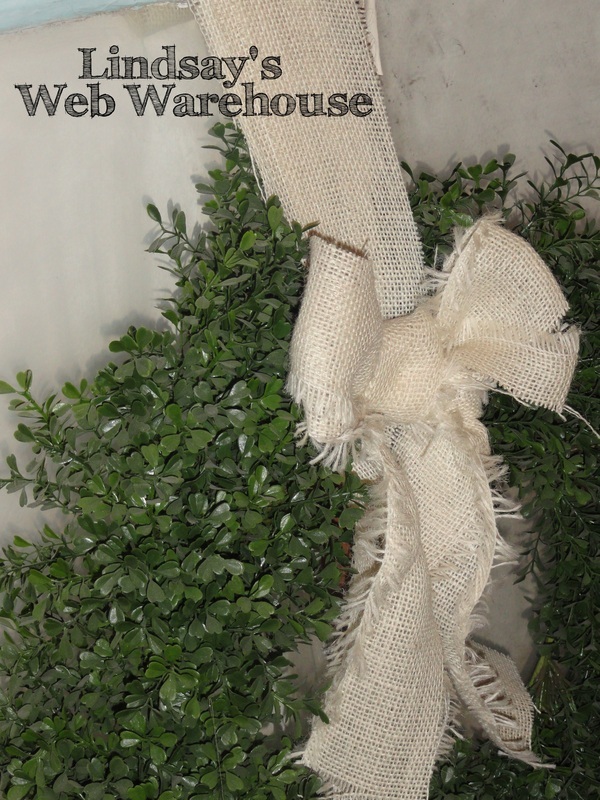 I told you I'm obsessed with burlap! 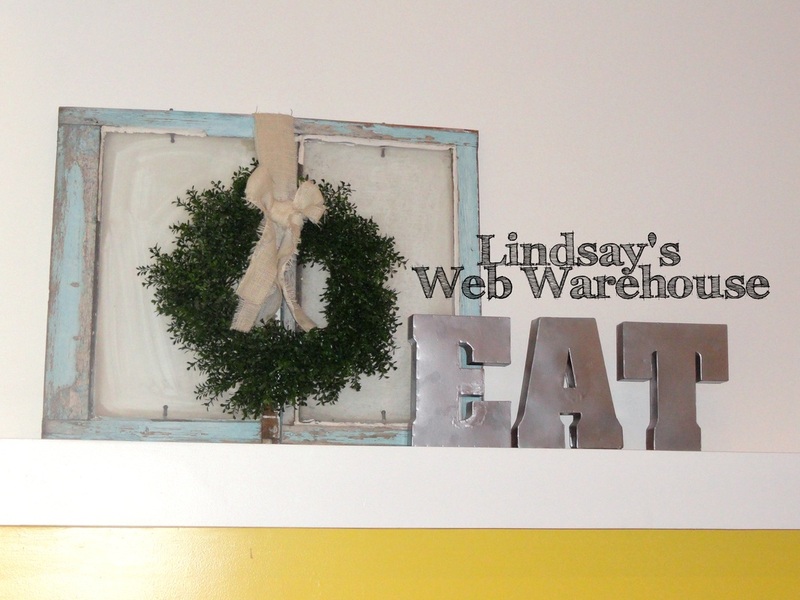 I cut the burlap into strips and attached my wreath to my frame with tacs. Probably a better idea to use something more secure to attach but I'm impatient. And its still holing. I made the bow separate and stitched it to the burlap strap. 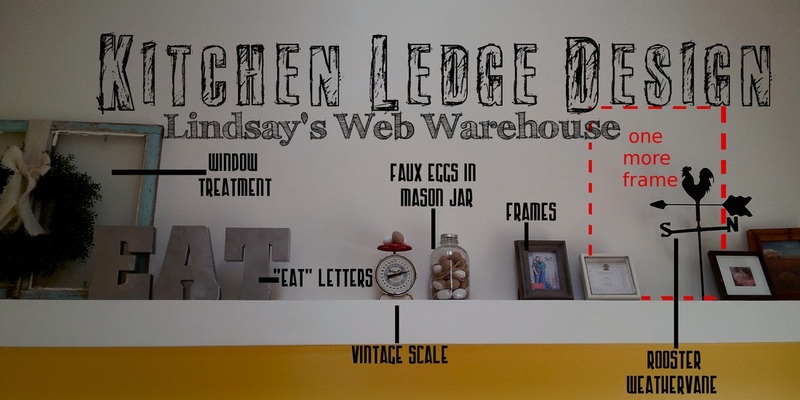 I have it on my ledge in my kitchen next to my "EAT" letters from my previous post. So proud of my $25 project! 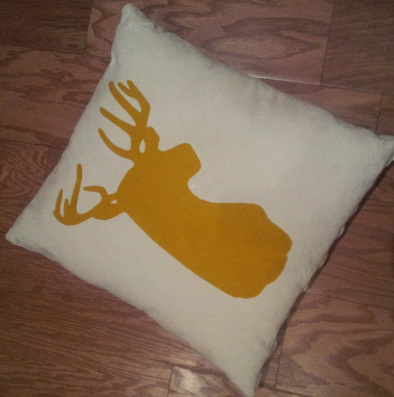 Have you seen those adorable deer silhouette pillows? Me too! I fell in love! I have been looking for a theme for our living room that would be both chic with a bit of a masculine twist for Jake. I found some pillows on Etsy but nothing exactly how I invisioned. Plus I wanted two different silhouettes. I got my material from Hobby Lobby; Duck clothe for my chevron patterned pillows, 8.99/yd and canvas for my deer pillows, 9.99/yd. 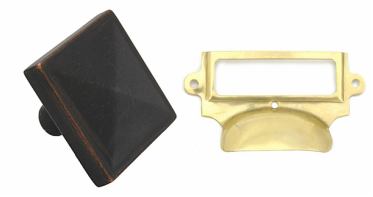 Both materials are great for the couch because they are stiffer and can handle a little more wear and tear. I didn't mind the cost for them to last longer! I used the current pillow covers to come up a template; so helpful! I started by turning my fabric in on itself, pattern sides facing each other. 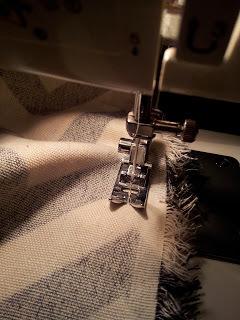 I cut enough fabric to leave a 1/4" to 1" of extra fabric around the edges for my seam. To save myself some sewing I didn't sew on the folded side, because it wasn't necessary. I wanted my pillows to have hidden zippers to add class but also to allow me to easily take them off when I need to wash them. Remember I have dogs? To insure your hidden zipper is accessible you need to make sure your zipper pull is also facing the inside, with the pattern portion, of the pillow. As you can see in the picture above I folded the top flap of fabric back up about and inch/inch and a half. I attached the zipper with pins and sewed the top portion first, about 1/4 " away from the zipper. The bottom flap I sewed the other end of the zipper to without folding up up. The sides of the pillow I sewed a 1/4'' seam down. I only had to sew two sides and the bottom with the zipper because I used the top as the fold. 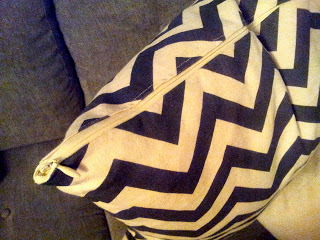 Once the pillow is flipped right side out the seams disappear and the zipper is hardly visible. It was much easier to figure out while looking at the original pillow cases that the couch came with. Thank goodness for those! 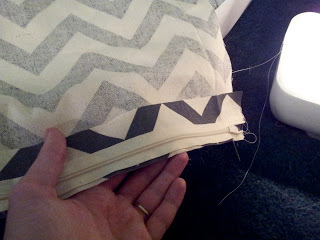 I went ahead and made one other chevron patterned pillow and two plain canvas pillows for my deer silhouettes. 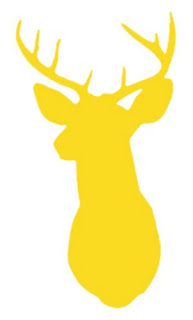 I choose my deer silhouettes from Google. I believe I just searched deer silhouettes; there were plently to choose from. I chose the bottom two images, one of a doe and fawn and the other of a buck. 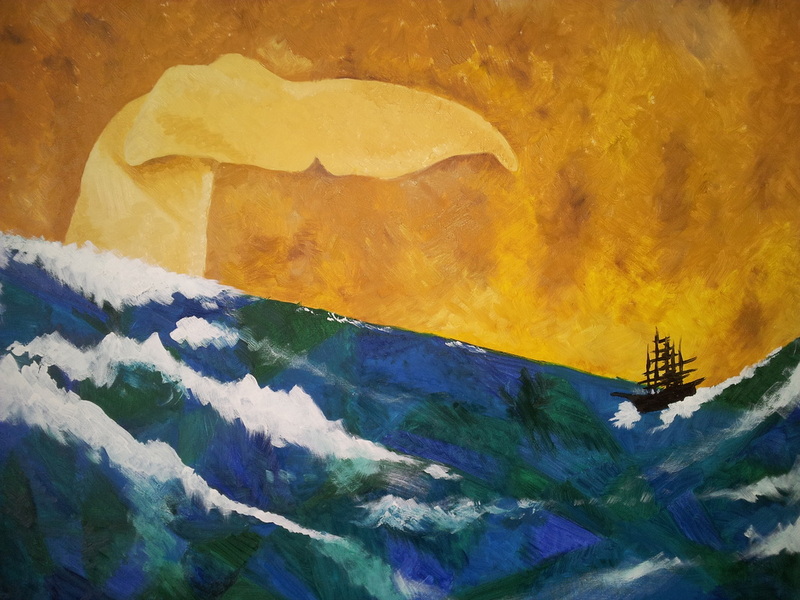 For my first attempt I actually pencil scetched on my canvas and painted on mustard fabric paint. That worked for a little while but some of my pencil marks were visable and after I washed them the paint looked weird. Blah! Don't you love learning from my mistakes? I bought some stiff, felt like mustard fabric. I got it at Joeanne's for $5.00 ish...sorry, that is just a guess. I got out my images and traced larger versions on my felt, cut them out and positioned them where I wanted, grabbed my fabric glue and smothered that baby down. I also did some securing stiches around the outline of my silhouetes. I am happy to say that I have had them for a couple months now and they are holding up fantastically! Wa-laaa! Beautiful shabby chic living room upgrade! I believe it was $50 ish total for the four pillows; zippers & material. 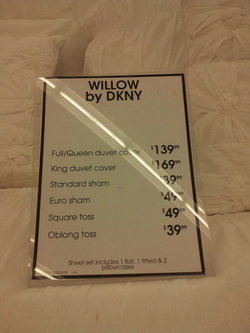 If you look for pillows in retail stores one pillow can easily be $30 if not more. I have used other "metallic" spray paints but they haven't come close to actually looking like metal. I bought these letters [bottom right] from Hobby lobby on sale. They were $4o all together; more than I thought I would pay but well worth it. The color when I bought them was a rusty brown color that didn't really go with my vision. ...I know I'm a nut. Jake couldn't stop laughing when I informed him that the metal was the wrong color. 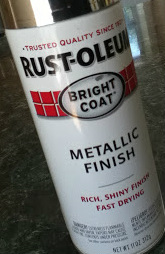 Lucky for me I did some research and read fabulous things about Rust-Oleum. I picked some up at Walmart for around $4. 2 coats later...finished beautiful metallic sheen. 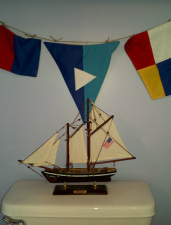 Have you ever noticed how much cute crap there is for a nautical theme? 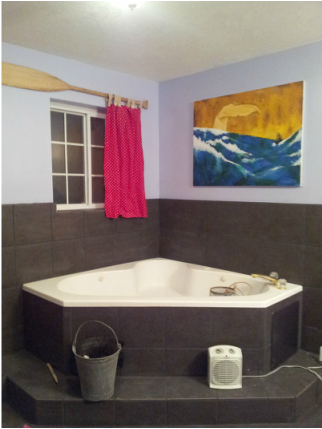 I decided that when Jake and I bought our home that I was going to do a "Nautical" themed bathroom. I'm still in the process but pretty far along so I thought I would share my progress. 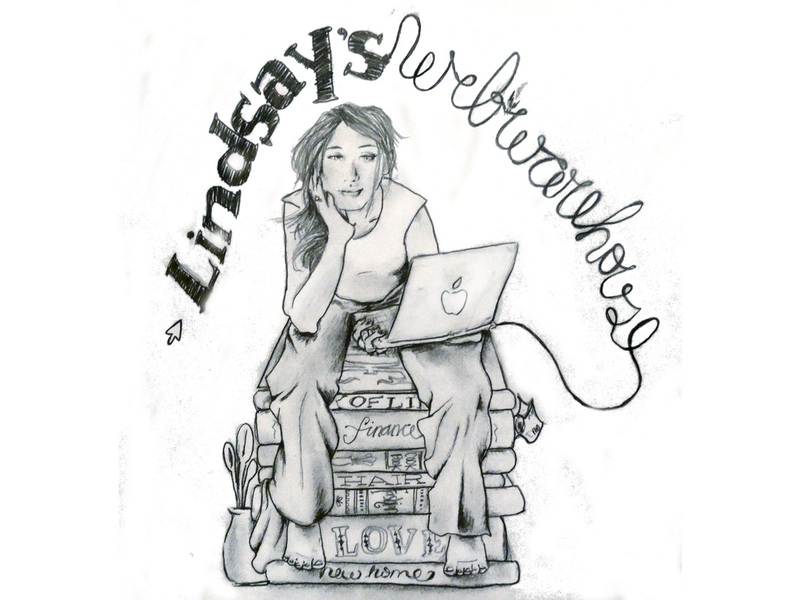 First, I always like having something that I've created in a room; the "Lindsay" touch if you will. 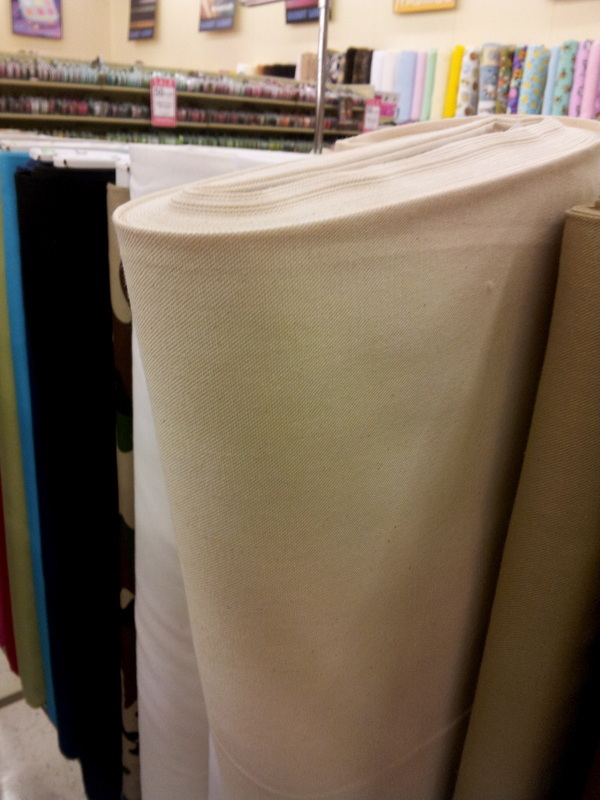 I bought a 14x16 canvas ($16 for 2 pk) navy blue material ($2/yd) and burlap ($2/yd) from Walmart. I bought the red polka dot material at Hobby Lobby ($7ish for 2yds). The other scraps I got from my material scraps, Corina and from Walmart's scrap mark down pile. First, I drew an outline of what I wanted Wallace's body to look like on moving paper. After some erasing, yelling and retracing I was able to cut it out. I pinned my diagram to my navy material and cut out the "body." The "cheek" and "water drops" were really easy to cut free hand because they were so much smaller. 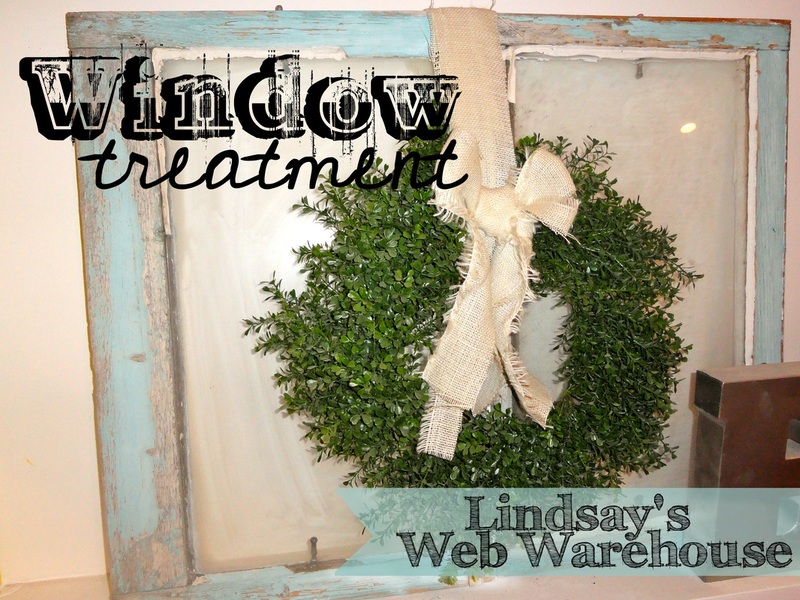 Once I had everything cut I pinned it all down, centered on my burlap. I proceeded to sew each piece on with matching thread. 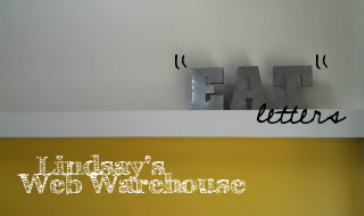 For Wallace's eye and mouth I set my sewing machine to a tighter stitch and chose a stark white thread. Flags, made by yours truly! Large Shell, from vacation to Cyprus, Greece. I made the frames to the right with little effort! I bought the shadow boxes at Michaels for $7/each, the starfish $2 and anchor $5 from Hobby Lobby. 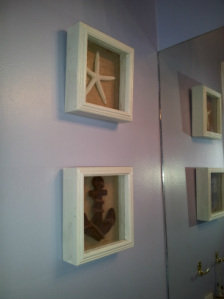 I used some extra burlap I had from Wallace the Whale to back the picture frames. I attached the anchor and starfish with tacky glue and let them sit for about an hour or so 'til dry. I painted my walls a lovely lavender color. I get most of my paint from Walmart in Colorplace. Its about $20/gallon. I found these cute bobbers [right] at Tai Pan Trading for $8. I made a replica of a image I found on Pinterest that I fell in love with. Alright final creation for this post. My "oar curtain." I'm going take a moment to be a little vain and say this is adorable. I got the idea from...drum roll...you guessed it! Pinterest! Once I get an idea I am obsessed. Corina, my awesome Mother-in-law, upon hearing of my obsession (I couldn't stop talking about it!) found an oar at a flea market for $15. I decided to only make one panel. 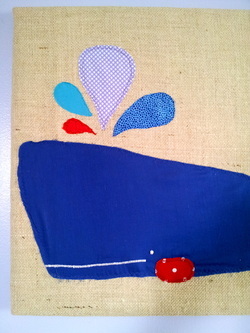 I used the red polka dot material from "Wallace the Whale". All I did was hem the sides. I attached the panel to the oar using loops of burlap. If you haven't noticed yet, I love that stuff! I also sewed mismatched white buttons where the loops met the panel to look as though they were buttoned on. I am terrible at button holes so I chose the cheater way out. You'll soon find that I am a sucker for cheap finds. AND that I love to try and make things myself or add my personal touch. I am sad to say, I did not record making the above pillow flower while I was doing, it but I will share! I bought the blue and white striped pillow on Amazon for $15 & with shipping it ended up being $20; not too bad for a pillow. 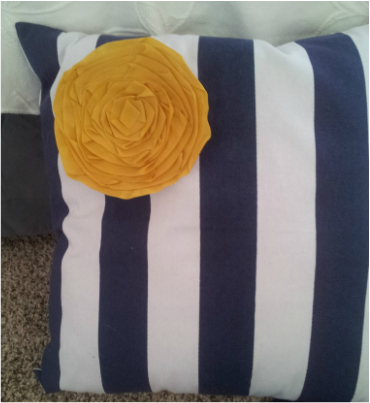 You can find cheaper pillows at Ross, TJ Max etc but I had my eye on this thick striped style. 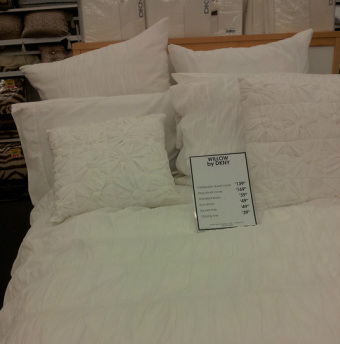 Pillows usually run $30-$80 bucks if your buying at RC Willey, Sears, Bed Bath & Beyond etc. Yikes! 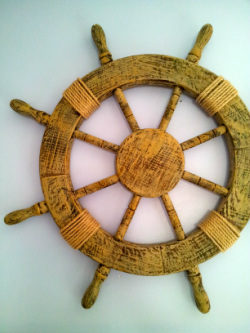 First off my inspiration for the room this goes in is Mustard Yellow, Grey, Navy & White. If you want the whole feel you can check out my pinterest board. Thats right. I said pinterest. I'm obsessed like everybody else. Making the mustard flower was beyond simple! I chose a mustard color ribbon l liked at Walmart; Non-shinny about 1-1 1/2 thick. I also bought some yellow thread to match. All together my purchases were around $5.00-$10.00. I used a scrap of canvas material for my backing; You don't need canvas but I recommend it for this project because it is a stiffer/sturdier material. 1.Cut your canvas in a circle, just a little smaller than you want your flower to be. 2. Start sewing your ribbon down beginning at the edge of your circle, not the middle! Sew around in a circle, gradually tapering inwards in a spiral. Don't worry about the fact that your ribbon is bunching and overlapping. If you look above at my flower the bunches and overlapping actually add to the cute-ness. 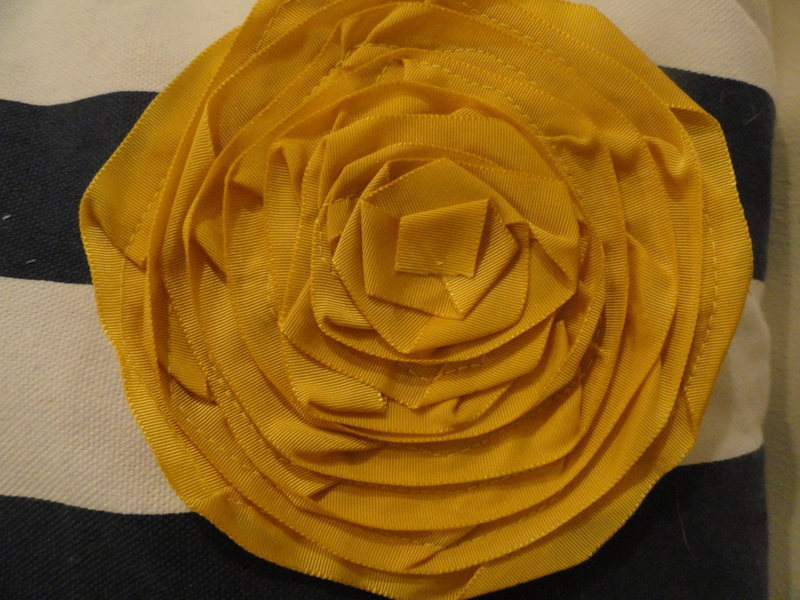 To finish off your flower you can hand stitch the last overlap to minimize stitching in the center. And that. is. it. Bada bing bada bom! This is my latest obsession since we bought a house. I love to paint, sew, create etc. And I love finding good deals. Get ready for some frugal sprucing!